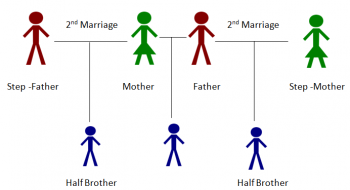 A half-brother shares ONE parent with you (either father or mother). He is a blood relative (50%). A stepbrother is someone who becomes your “brother” because one of your parents remarries and the person he/she marries already has children. A stepbrother is NOT a blood relative.